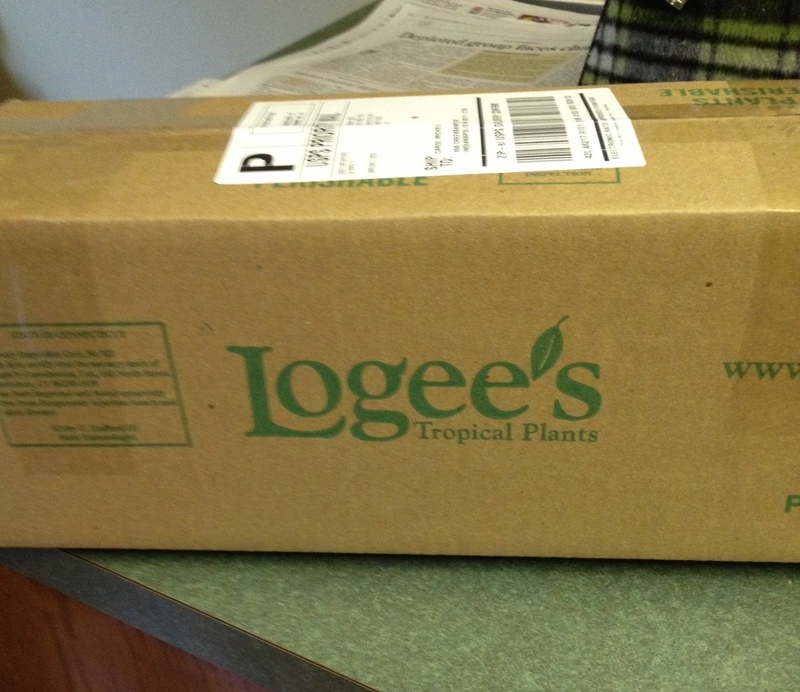 Care to talk about this box from Logee's Greenhouse that showed up on your porch yesterday, Carol? Well, that depends, Dr. Hortfreud, if you think it is a good thing or a bad thing or just a thing that there was a box with plants. For now, let's consider it just a thing. What plant was in the box? So it was more than one plant, Carol? Well, actually, there were three plants in the box, with the potential for many more. Interesting. Let's see what's in the box. Okay, Dr. Hortfreud. 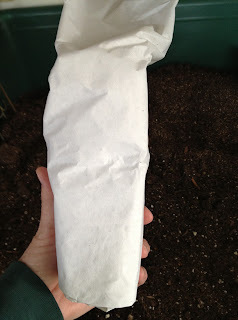 There were three plants wrapped up like this. Okay, they look well wrapped. Care to show me the actually plant? Well, inside that wrapping, there was this wrapping. Nice sneak peak. Show me the rest of the plant. Remember I'm paid by the minute. When I took off the black wrapping, there was this. The white stuff is a nice touch. 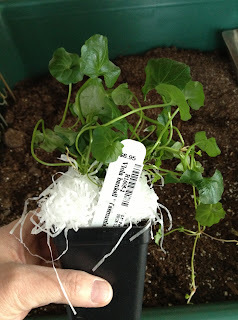 Yes, that's helping it stay moist and keeps the dirt from falling out of the pot during shipping. 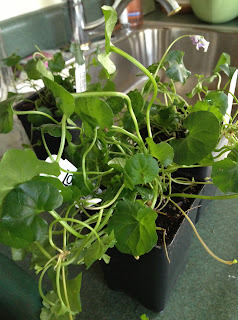 I bought three Viola banksii. Very nice, Carol. Wherever did you get the idea for this plant? From The New Terrarium by Tovah Martin. 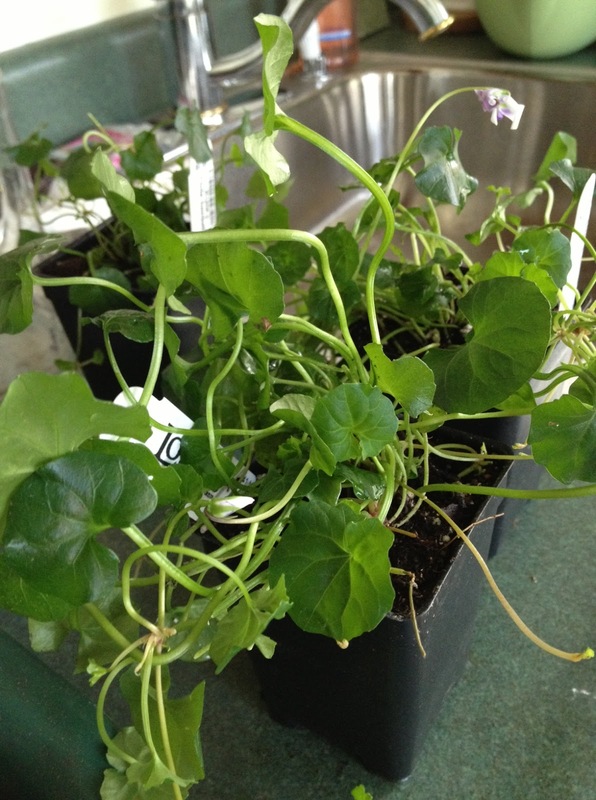 She mentioned Viola hederacea as a terrarium plant and suddenly, I had to have it. "Suddenly, you had to have it" I've heard that before, about a hundred times, if I've heard it once. That's the elephant in you talking, no doubt. But you bought Viola banksii? Well, that's because I couldn't find any V. hederacea online but I did find V. banksii. They were once thought to be the same plant but later it was determined that they are different and V. banksii is available, and V. hederacea isn't, so that's why I bought V. banskii. Carol, it concerns me a bit, but that actually seems to make sense. What are your plans for V. banskii? 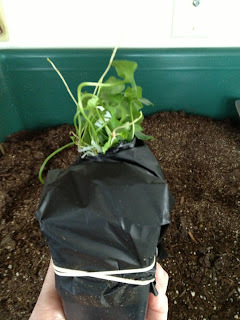 Well, I'm going to plant one of the plants in a low wide container and put it under my cloche, maybe with little feet under it to provide some air circulation. I'm going to pot up another one to take to work. Then the third one I think I'll put in a small hanging basket and hang it in the sunroom. This viola spreads by sending out little plantlets, so I hope to soon have more of these plants, maybe to share with others. Seems like a good plan, especially the part about sharing with others. That's always good. I will remind you, gently, that it took you over eight years to plant your Wardian case. I thought you would never plant it, but you proved me wrong, again. When do you plan to plant up these violas? This weekend, Dr. Hortfreud. I've learned my lesson. I promise. Good, Carol. There is hope for you yet, I think. Now, please see Miss Jane Hortaway on your way out to make your next appointment for Monday. I want to check on your progress on potting up of these violas. Will do. Thank you, Dr. H. I find our sessions very helpful. Hi Marie, I don't see those here. I guess/hope they got removed as spam! Love the leaves! Show us another photo soon. Ooooohhhh very nice... Ah yes the elephant stalks again but has moved to on line shopping??? LOL Am looking forward to seeing them planted in their new home. Tovah Martin is always feeding my elephant. I am ready to shop again. You do seem to benefit from these sessions with Dr Hortfreud. Your friends are glad you continue to spend time with her. It is always a good read when you are having discussion with Dr Hortfreud, always make my day! I only know pansies and violas from the flowers, and it is my favorite even if we cannot grow them with our climate. So the first time i saw it in Sweden, I almost stay with it in the park. I guess i need to have appointment too with Dr Hortfreud, how much does he charge per hour?